Ever wonder how to host a great RuneScape party? Are you thinking about hosting your own party in the game? This guide will explain all about having a great party, and will contain info such as party places, party types, worlds, times, foods, games, planning, and tips. To start off, we will give some tips on hosting and having a great party. To host a successful party you should join a forum. Have lots of prizes, games, drops etc. Try to make it sound exciting by making underbanners, colored text and other graphics. Don't make it exclusive unless you only want your friends to come. Say something like "everyone's welcome!" Chicken Tag is quite a fun game. Instructions: This game is just like tag. The person that is "it" has to whack another player. Once the player has been whacked they are "it" and must tag someone else. Hide and Seek is another fun game that you can play. Required Items: Maybe a prize for the winner. Instructions: Usually the host of the party goes and hides somewhere in the town or location you are in. You must turn your friends chat off so that no one may find you on the minimap. You should tell them before the game what area you will be hiding in. Once one of the players have found you, you turn your friends chat back on and tell everyone that the game is over. Skill Races are good games for skill-leveling parties. Instructions: The point of the game is to be the fastest miner, woodcutter or other skill leveler. You usually make the race the same skill as you're having the party for. First, you tell everyone to go to a rock, tree or other area nearby. Then you count down from 3 and say "Go!" Everyone must start mining, cutting or otherwise training the skill. The first person to mine a rock, cut a tree or otherwise successfully complete the "task" and trade you is the winner. Of course, you can bring any type of food that you'd like to bring; these are just some ideas. Description: A Drop party is a party where the host and friends drop items for others to pick up. They usually do it in different spots as to give others more of a chance and to make it more fun. Party Place: The best and only place to hold a drop party would be at the Falador Party Room, located in northeast Falador. This place is for drop parties both big and small. Worlds: If you want it to be a private party try to host in an un-crowded world, or if it is crowded host it in a pre-planned building. Times: Well, if it's a private party with just you and a few friends, you can sort out a good time with them. If you're hosting a big party for a forum then you should check out the Party Times Help topic for help deciding on a good time. Members of the forum community will usually give you feedback on the times. Games: Games are not needed here. The drop party is the game. Food: The drop party is usually part of a party. But if you are holding a single drop party going back to a pub after or buying a few beers is a good way to end a drop party. Planning: It's good to tell people in advance through e-mail or RuneScape. If you're on a forum, try to set it out nicely with colorful headings and under-banners etcetera. PM people, make a guest list and post the event about 1-2 weeks before it's going to happen. Description: A birthday party is celebrating your day of birth. This should include lots of games, prizes and food. If you really want to you could have a Pking trip. But it is recommended to do this at the end as it breaks up the group. Party Place: There are many places to hold Birthday parties. 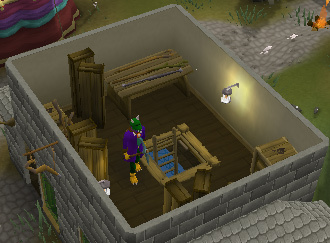 If you are a member of this forum, a good place is the party house in Falador. You can hold it anywhere you want though. Try holding it in a house so only you and your friends can talk and play. 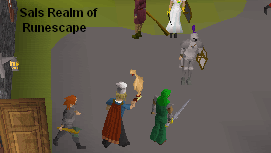 Falador is probably the best place as it has lots of houses to choose from. Worlds: Preferably a world that you have already arranged. A good world would be the least crowded one that is closest to your country. Games: Choose the ones you want from the above list. Food: You need lots of yummy food for parties. Gnome Cocktails will do well. Lots of beer and meat and redberry pies. Description: A Skill Leveling Party usually means you have achieved a high level in a particular skill. These are just usually a few screenshots and a Skill-Leveling Race that ends with a few beers. However, you can make it as exciting as you want. But you usually do the above with these types of parties. Party Place: You usually hold your party at the place you raised the skill in. For example, if you got level 85 Mining you would hold it in Dwarven Mines or a similar place. Or you could start at a pub and make your way to the mines, whatever takes your fancy. Worlds: Preferably a world that you have already arranged. A good world would be the least crowded world that is closest to your country. Games: Naturally, you would play the Skill-Leveling game as that's what the party is about. But you can spice it up with the other games if you would like. Planning: It's good to tell people in advance through e-mail or RuneScape. If you're on a forum, try to set it out nicely with colorful headings and under-banners. PM people, make a guest list and post the event about 1-2 weeks before it's going to happen. Description: Having a party at your house is a great way to hang out! There are many sorts of house parties such as Dungeon parties - these normally attract a lot of guests. There is also combat parties, including lots of combat and fighting! Worlds: World 6 is very good as there is lots of people there, but sometimes it can be hard to attract guests since lots of people with high construction come here trying to get guests come to their house, only go to world 6 if you have high construction! If you have a fairly low construction go to a packed world closest to your location. Times: At night is the best, never have a party in the morning since most people have School or College to attend. Games: If you have a games room, put some money in the chest and play some games, many people like combat so add a combat room if you can! For the higher levels a scary dungeon is recommend! Having an oubliette and throne room is great since you can send people into the cage below, wondering what horrors await them! Food: The kitchen will be the main source at a house, you can make a few snacks like tea and cakes. In the kitchen also is a beer barrel where your guests can get free beer. Planning: You don't normally have to plan these since you can get lots of guests at the house portal, if you want you can advertise on the forums or sending friends PM's.